Rissers Beach in the early morning. Rissers Beach is one of the nicest places to spend a hot summer day or camp on Nova Scotia’s south shore. 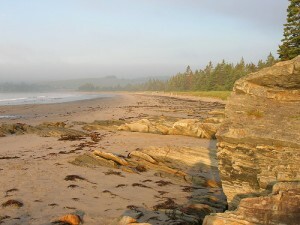 Just south of Lunenburg and Bridgewater, kids will love playing on its long white sand beach. You’ll often find events going on like lifeguarding and sand castle competitions. Jump in for a swim or stop for a picnic. You can bring your own spread of food or buy light snacks from the on-site canteen. There are also showers to wash off the salt after your ocean dip. While you’re there, don’t miss the chance to stroll along the boardwalk through a marsh where you can observe the local wildlife. Visit the interpretation centre to learn more about the surrounding environment. At night, retire to one of the 90 campsites located within the park. This is a popular destination so making a reservation is a good idea during the peak months of July and August, especially at weekends. Directions: Go south on Highway 103 from Lunenburg and Bridgewater. The park is on Route 331, near Petite Rivière and you’ll find it about 15km south of Exit 15. Open: From mid-May to mid-October.